Pilgrim did all the work and made a mapping for all darkstone skins. The contents of this article descen from the agora-forum. Special thanks to Pilgrim! 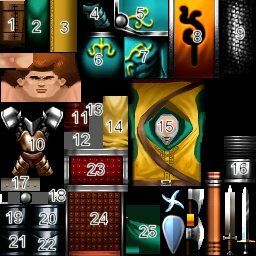 Targas are the graphics that Darkstone uses, and there is one skin targa (plus one suffixed with _face which is the profile used in the menu and character sheet) for each of the eight classes. These targas can be edited with an art program, and when placed in the Darkstone/Skin folder then characters created with the same name as the targa will be reskinned with it (or you can rename the targa to that of your character instead). Characters cannot use skins from different classes as because the 3D models are different sizes they will not mesh properly in the game. If you want a targa to be the class's default skin then rename them DSI01 to DSI08. 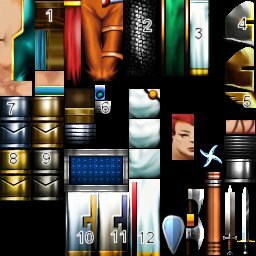 Skins must be saved in an uncompressed 24 bit format (if they appear white during the game then they have been saved compressed instead). Below are maps of the class targas, numbered to show how the blocks correspond to the model. Some blocks are not numbered because either they are not used or are clearly the weapons, flesh and face (if a smaller face is present then this is the one used beneath a helmet). 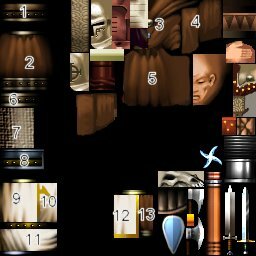 There are five armour stages (with 0 meaning what the model looks like without armour). 08: Tunic and shoulder pads. 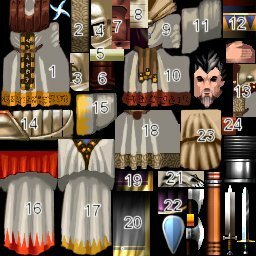 09: Chainmail sleeves and trousers. 16: Elbow cops and knee cops. 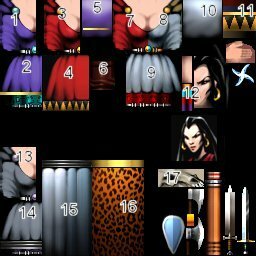 20: Shoulder pads and thighs. 22: Helmet and upper arms. 04: Replaces the same outter-thigh part of block 10. 05: Ponytail and hairband (yellow band at top). 04: Helmet's band (red strip). 10: Robe (tethers mark the front). 01: Tunic and robe (tethers mark the front). 17: Waistcoat (top of block). 20: Cape (mirrored from the left after the dot). 09: Skirt and side of blouse. 04: Helmet's band (triangular hem of skirt). 11: Cape's inside (top strip). 16: Cape (mirrored from left and upside down: gold strip is hem) and helmet. 11: Cape's inside (bottom strip). 15: Cape (mirrored from left) and scapular (mirrored from right). 12: Tunic's front and pants. 13: Arm, sleeve and wristband. 20: Arm of weapon hand. 03: Armour, boots, greaves and shoulder pads. 19: Helmet and mouth scarf. 04: Armour, gloves, shoulder pads and knee cops. 05: Chainmail for trousers, helmet and gloves. 06: Breastplate (mirrored from left), boots, greaves, shoulder pads, gauntlets, pants, helmet's back. 19: Upper legs, sleeves, helmet and tunic front. 04: Tunic (this is covered by block 03 though). 08: Upper legs, boots, helmet and face scarf. 15: Pants, knee-cops and greaves. 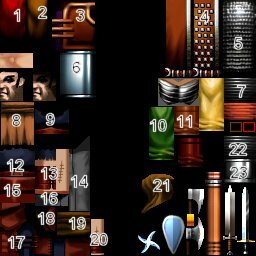 12: Pants, girdle, shoulder pads, vambraces, gauntlets, knee-cops, greaves and dagger scabards). 14: Upper trousers, boots, helmet and face scarf. 13: Robe and sleeves trim (lower band). 08: Sleeves trim (inner strip). 09: Helmet, robe and cape. 03: Tunic, gloved vambraces, skirt, helmet and helmet wings (made from gold trim). 10: Skirt, gloved vambraces and scapular. 12: Vertical strip on skirt's front. 09: Boots and gloved vambraces. My meagre attempts at skinning can be viewed and downloaded from this article. 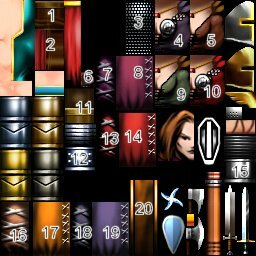 Though my artistic skills are very low I nonetheless provide some hints at technical understanding the whole custom skins act in Darkstone. What you'll need in order create your custom skins are the default skins (so-called SkinKit), which can be downloaded from here. 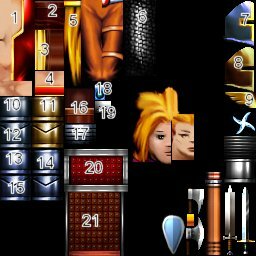 To create / adapt the targa bitmaps you'll also need some image processing tool like Photoshop, Paintshop, Gimp or something similar. Bring your installed Darkstone version to 1.04 or higher, so you can use custom skins. It's strictly recommended to patch up to the latest version (1.05b) anyway. You can download the Patches at the category Patches. In order to use custom skins in your Darkstone game folder the subdirectory "skin" has to exists. Case and singular matters, so "Skin" or "skins" won't work either! To use a custom skin for your character, two files must exist in the skin-folder: "charactername.tga" and for the face "charactername_face.tga". Your Windows OS may not display the correct file-extensions if you didn't customize your explorer options, so be careful that the files aren't named charactername.tga.tga. If Darkstone is unable to load the skin file it takes the default skin for the appropriate character class. If the skin file can be loaded but is corrupt (i.e. wrong targa bitmap format) the character is shown as a white ghost. The white / ghost skin appears usually when using a wrong file format for the skin files. You need to make sure that your skins are stored as 24-bit uncompressed targa bitmaps. If the textures don't fit to the character model, it's mostly because you are using a wrong type of skin. Pay attention to the fact, that a skin for the amazon class can only be used with an amazon model as well. It should not be used on other characters (i.e. monks, rangers, etc.). 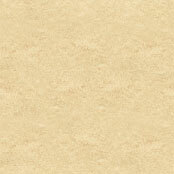 A detailed mapping for the contents of the targa skins can be found in the article Skins Targa Mapping. Now open the skin file and make your changes. You could cut special regions of the skin, edit them and paste them back to the original skin file. To view the changes it is recommended to run Darkstone simultaneously and switch between your image processing tool and Darkstone with ALT + TAB. You have to reload a savegame in order to make the changes on the skin viewable.